The government amended their proposed legislation last month for charges applicable to single use plastic carrier bags. Propose 5p bag tax on single use plastic carriers effective October 15th. Applies to single use carriers below 49 micron. Minimum 5p charge required between 50-70 micron and replaced FOC. 70 micron plastic carriers are proposed to be exempt – no charge. Government will collect the VAT from the proposed charge. Net proceeds at the discretion of retailer. Business with less than 250 employees are exempt. Various other exemptions detailed overleaf. Plastic bags thicker than 70 micron will be exempt from the charge. Bags below 50 micron will have to be charged at a minimum of 5p. Bags between 50-70 micron will need to be charged to the consumer at a minimum of 5p. However, these bags will have to be replaced FOC, should the consumer return to the store. At this stage, there is some speculation within the industry that the 70 micron exemption may not get through parliament. However, should it get approved, you will be able to provide 70 micron plastic bags to customers FOC. A SUCB means an unused bag made of lightweight plastic material with handles, other than an excluded bag. Unwrapped food bag: A bag intended to be used solely to contain wholly or partly unwrapped food for human or animal consumption. Unwrapped loose seeds bag: A bag intended to be used solely to contain wholly or partly unwrapped loose seeds, bulbs, corns, rhizomes, flowers or goods contaminated by soil. Unwrapped blades bag: A bag intended to be used solely to contain wholly or partly unwrapped axes, knives, knife blades or razor blades. Prescription-only medicine bag: A bag intended to be used solely to contain a prescription-only medicine, a pharmacy medicine or a listed appliance sold in accordance with a prescription issued by a doctor, dentist, supplementary prescriber, nurse independent prescriber, independent nurse prescriber, optometrist independent prescriber, pharmacist independent prescriber or EEA health professional. Uncooked meat food bag: A bag intended to be used solely to contain uncooked fish or fish products, meat or meat products or poultry or poultry products. Live aquatic creatures bag: A bag intended to be used solely to contain live aquatic creatures in water. Woven plastic bag A bag the material of which is made by interlacing long threads passing in one direction with others at a right angle to them. Transit goods bag A bag which is intended to be used to carry goods in a transit place. Following the English government’s decision to impose a 5p levy on single-use plastic carrier bags, a series of stipulations were issued regarding the sizes and thicknesses of bags affected (see above). Essentially, bags below 49 microns thick were to be subject to the charge; bags of 50-70 microns thick would also attract a levy of 5p but must be replaced free of charge should the customer return them to the store. Bags thicker than 70 microns would be exempt from the single-use charge altogether. Such bags are deemed to be more substantial with many falling into the ‘luxury carrier bag’ sector of retailing. Industry insiders were sceptical at whether the 70 microns exemption would be passed by Parliament. Interestingly, woven carrier bags and ‘bags for life’ also fell within the exemptions category. A woven bag can be made of polypropylene or a natural fabric such as cotton canvas. Typically, woven carrier bags are strong enough to withstand multiple re-use. 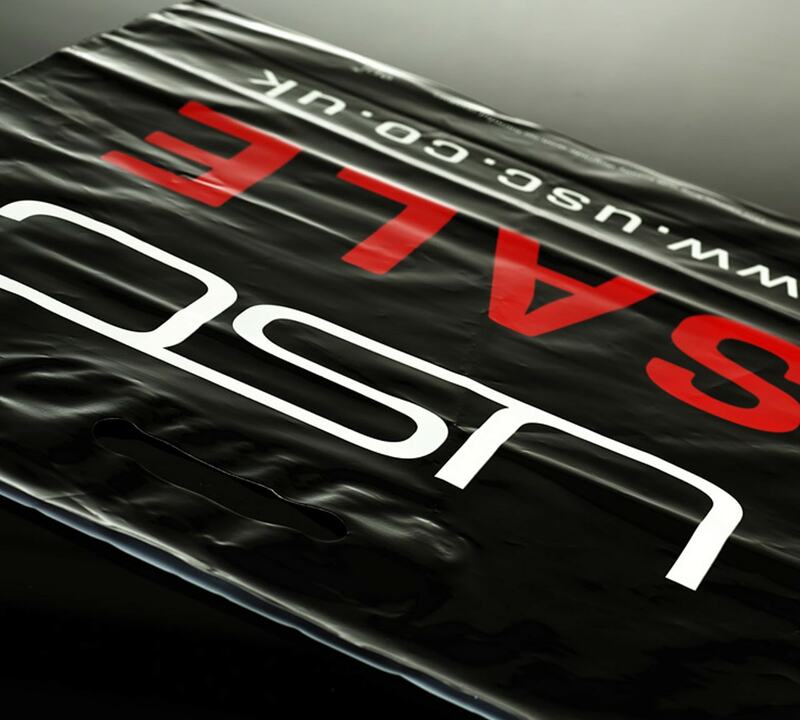 Keenpac offers a wide range of bespoke woven carrier bags in both polypropylene and natural fabrics. The government also decreed the 5p charge should be VAT inclusive. So, where retailers are liable to charge VAT, the amount they charge for a bag is tax inclusive of the standard rate of VAT. For VAT-registered suppliers charging 5p, the taxable amount will be 4.17 pence and the VAT 0.83p. Non-VAT-registered suppliers still need to charge the same minimum amount of 5p. Suppliers using a retail scheme must ensure VAT is properly accounted for through their scheme. Read more about the carrier bag charge, exemptions and VAT implication at. The proceeds from the carrier bag charge are, in most cases, being channelled into ‘good causes’ by the retailers and/or their customers’ wishes. Typical recipients are charities local and national, environmental groups, community groups, the arts and more. The government’s carrier bag levy has resulted in around £29 million in donations to such groups.